This autumn could see a larger than usual influx of rats and mice into our homes, offices, shops, factories and farms. We haven’t had much of a summer in New Zealand but the wetter than usual weather has been good for the growth of plants and their production of fruit, seeds and nuts. The abundance of food this provides for rats and mice means that rodent numbers are likely to be high in the bush, parks and gardens of the country. At this time each year pest rodents move into our buildings. When autumn gets colder and the fruits, seeds and nuts diminish the rats and mice seek shelter and alternative food sources. When they find a nice dry insulated sheltered attic with food to be found in the kitchen below they will quickly build a nest, and continue breeding. Timely action now to prevent rats and mice getting inside and to deal with them quickly if they gain entry, will save time and effort later during winter. 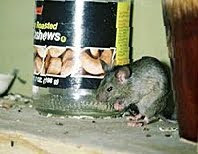 Deny rodents entry - Go outside and examine your buildings for possible entry points. A mouse can squeeze beneath a door if there is a gap large enough to fit a pencil a young rat is only a little larger than a mouse! Draft excluding brush strips, are an ideal method of proofing such gaps. You might also consider placing some rodenticide around the exterior of the house to reduce the numbers that might find their way in. Deny rodents food – Take 10 minutes to look around your kitchen and check that should a mouse or rat get in that there is no food behind the fridge, or spilled down the side of the cooker. Check that dried good such as cereals are in sealed, preferably metal, containers. Make sure butter and even bars of soap are out of the reach of rodents. Remember, rats and mice are excellent climbers and just putting food high on a shelf may not be out of their reach. Be ready for rodent entry – No matter how carefully you find and seal possible entry points if you can get into a building through and open door so can a rat or mouse. They may also get in carried in a box of goods and there are almost always other possible entry points around any building. So it is always wise to keep fresh rodenticide bait in place in safe places such as the roof void so that any rodents that get in are dealt with before you know about them. Put bait in safe places NOW. Don't wait for signs of their entry. Place the bait where rodents might encounter it but where pets and children cannot. Set traps as well. Rodenticide baits are more effective than traps but once a rodent has taken some bait it is more likely to get caught in a trap and body can then be removed. Particularly if dealing with roof rats block baits should be fixed in place so that the rats cannot take it away and store it. Some baits have holes so that they can be nailed in place in voids and fixed by use of a wire. Block baits without holes can be put in a plastic bag and the bag fixed in place. Carry out this rodent proofing now and you give yourself the best chance of staying free from pest rats and mice this winter. Three rats are sitting at the bar bragging about their bravery and toughness. The first says, "I'm so tough, once I ate a whole bagful of rat poison!" The second says, "Well I'm so tough, once I was caught in a rat trap and I gnawed it apart!" Then the third rat gets up and says, "Later guys, I'm off home to beat up the cat." The Awards for the best displays at this year's Ellerslie Flower Show were announced yesterday evening. Find out who won. 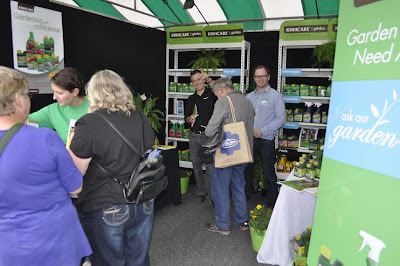 I was manning the Kiwicare stand at CR1 and answering garden and pest control questions from the hundreds VIP guests invited to the award ceremony. The evening was hot and sunny and this suited the finely dressed ladies and gentlemen. Ladies in their summer frocks and gentlemen in their rolled up sleeves and sunnies wandered the Show with glasses of wine in hand. The Kiwicare stand won a Silver Award, so well done to the team that put it together. At the stand is a demonstration of the Kiwicare Organic weedkiller where you can spray some weeds, take a walk around the show and then return to see how the weeds have fallen over on the way to death. There is also a live link to the Kiwicare garden website problem solver. You can surf and see if your garden problems are listed on the site and find the solutions. 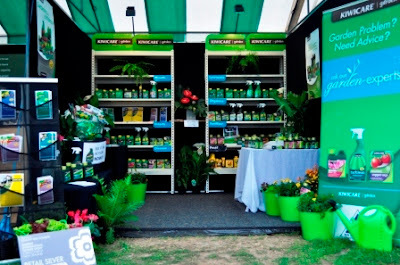 You can also enter a draw to win $500 worth of garden products.......it could be well worth a visit. I will be there today (Wednesday 7th March) and again on Sunday (11th) to continue answering your questions. Ben Adams will be there with his gardening knowledge on the intervening days. A qualified student from the School of Floristry is designing and 'constructing' a display to be added to the Kiwicare stand so come along and see it. At a marriage guidance session the instructor asks the husbands to name their wives favourite flower. A husband leans over to his wife and whispers "It's self raising, isn't it?" Zoonoses are diseases caught from animals. Wild rats and mice carry several diseases that can be passed on to humans. The most famous epidemic caused by close association of rats with people is the Black Death which caused the death of millions in 14th century Europe. The disease was the plague caused by the bacterium Yersinia pestis. Plague still infects and kills people world wide but thankfully not in New Zealand. But there are other serious diseases that can be caught from wild (and pet) rodents in New Zealand. Leptospirosis, also known as Wiel's disease, is caused by the bacteria Leptospira. It is carried by rodents, and other wild animals. Infection is through contact with water, food, or soil containing urine from an infected animal. Cuts or breaks in the skin will also allow in infection. Infected people experience a range of symptoms from mild or no illness to severe or life-threatening meningitis, liver damage and kidney failure. Infection can be prevented by avoiding contact with water that might be contaminated with animal urine. Salmonellosos is commonly associated with poor hygiene or inadequately cooked food, but can also be acquired from rodents. Salmonella bacteria may be found in the feces of many animals including wild and pet rodents. Infection can be contracted by people who do not wash their hands after contact with rodent droppings or if food, drink or eating utensils are contaminated with rodent droppings. Rat Bite Fever is caused by Streptobacillus bacteria that is found in the mouth of apparently healthy rats and mice. People are infected through bites or scratches from rodents or may also become ill after eating contaminated food or drink or through close contact with rodents. In cases of bites and scratches, the wound often has healed before symptoms begin (2-10 days after the bite). Antibiotic treatment for this disease is very effective. Illness in those who do not seek medical attention and treatment can be very serious and result in death; therefore it is important to immediately clean and disinfect wounds and promptly seek medical attention after any rodent bite or scratch. Wear gloves when carrying out pest control against rodents or working in areas where there are signs rats or mice a have been active. Wash hands after handling anything that rats or mice may have urinated on. Rodents continually dribble urine where ever they travel. In roof voids and other enclosed spaces where rodents have been it is sensible to wear a mask as dust may carry disease organisms. Clean up rodent droppings where ever they are found and disinfect surfaces where rodents could have travelled. Dispose of any food that have been eaten or may have been contaminated by rodents. If biten or scratched by rodents always clean and disinfect wounds and seek medical attention immediately. Two rats are in a bar. One turns to the other and in a drunken slurr says "I slept with your mother thats right your mother" the other just looked at him and said "Dad go home your drunk." There are species of flea evolved to feed on most terrestrial animals: cat fleas feed predominantly on cats, dog fleas feed predominantly on dogs, human fleas feed predominantly on humans and bird fleas feed predominantly on birds. It seems that in the Jurassic period, even the dinosaurs had dinosaur fleas. And the dinosaur flea was huge, compared with its tiny modern descendants. Dinosaur bloodsuckers were 2cm long - eight times the size of today's fleas, researchers report in the journal Nature. Flea fossils 125 million to 165 million years old found in China are evidence of the oldest fleas. Their very long proboscis, or hypodermic needle-like mouth, had sharp saw-like serrated edges for cutting through the tough hide of their dinosaur hosts. But the ancient fleas had one big difference from modern ones: They could not jump the way modern fleas do. Perhaps today's fleas seem less of a problem if one thinks of what a dinosaur flea could do to you if they were still around. 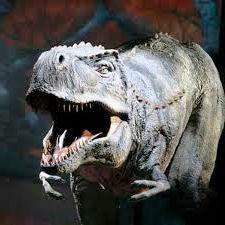 What type of dinosaur always has a word to say? The Ellerslie International Flower Show is on this week in Hagley Park Christchurch. Last year's show was cancelled after the Christchurch quake so it great to see some normality returning to the city and the show will help to raise spirits. I will be attending the show for the VIP dinner and awards on Tuesday evening and them all day Tuesday and Sunday. If you are in Christchurch or visiting the show come and speak to me at site CR1 next to the Rendezvous Hotel Corporate Village.